The people who serve our country deserve better than the president's insults. With the D.C. 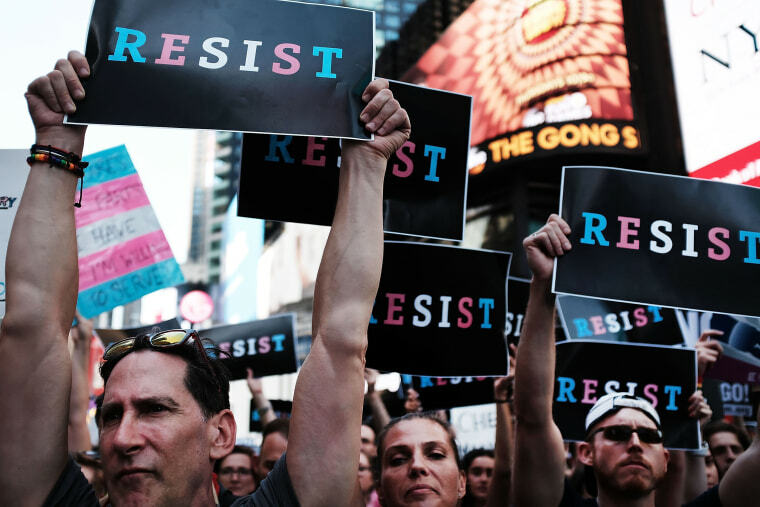 Circuit Court of Appeals scheduled to hear oral arguments on Monday in the Doe v. Trump legal challenge to the transgender military ban, Trump's Justice Department is expected to make arguments diminishing the humanity of transgender people and insulting their willingness to put their lives on the line to defend this nation. Though the Trump administration has falsely called service by transgender people a matter of national urgency — even going so far as to attempt a leapfrog of normal legal process by asking the U.S. Supreme Court to step in prematurely — the only response from the court should be to affirm the equal dignity of transgender Americans and their right to full participation in American life, including the right to serve their country with honor. The proposed transgender military ban (endorsed by a commander-in-chief who did not serve when he had the opportunity) is a slap in the face to those transgender persons who have served, who are serving, or who want to serve. By banning transgender people from serving in the military, the Trump administration denigrates honorable service of transgender people who have already fought and died and sacrificed alongside their fellow soldiers. The ban is further discredited by being counterproductive to the strength of our military forces. The military itself has recognized that arbitrarily barring qualified individuals from service harms its readiness and ability to recruit and retain talent. In a 2016 press briefing, Secretary of Defense Ash Carter noted, “[w]e have to have access to 100 percent of America’s population for our all-volunteer force to be able to recruit from among them the most highly qualified and to retain them.” At a time when the military struggles to meet recruiting goals, it is not only shameful but irrational to deny those who want to serve their country the opportunity to do so. Besides which, the administration’s reasoning for the ban and claims about “unit cohesion” are stale and recycled, having been previously discredited time and again when used against people of color, women and gay men and lesbians. Military service has — counter to arguments about the inability of servicemembers to effectively work and fight alongside of all other Americans who have made the commitment to serve — played a critical role in breaking down stereotypes of marginalized groups and making the promise of equal citizenship real. OpinionTrump can't erase transgender people with a memo. But he can make our lives a lot harder. Time and again, individuals facing extreme prejudice in civilian life have, despite those prejudices, signed up to fight for their country. It occurred during the Civil War when black people sought to serve in the Union military, and again during World Wars I and II. Similarly, during World War II, thousands of Japanese Americans who had their loyalty questioned and their freedoms rescinded by internment nevertheless volunteered to serve (and later became one of the most decorated units in the war). Racial integration inside the military had reverberations outside it. And from women in combat to the end of “don’t ask don’t tell,” honorable military service has also shown the ability to tear down broader barriers to equality for marginalized groups. Though barriers to true equality remain, we have seen time and again how the service and sacrifice of marginalized groups expand their opportunities by demonstrating the falsity of stereotypes. As a result, a black man has been Chairman of the Joint Chiefs of Staff, an openly gay man has led the Army and women have been our chief diplomats, attorneys general and a secretary of the Air Force. Individuals from marginalized groups today serve in the halls of Congress and governor mansions, in corporate boardrooms, and on the federal bench. Military service opened doors and minds in ways little else could. When confronted with clear injustices, we as a nation have not always risen to the occasion. Too often, we have remained on the sidelines as we witnessed discrimination. We remained silent and permitted the enslavement of millions. We remained silent and permitted the displacement of Native Americans. We remained silent and permitted the mass deportation of Mexican Americans during the Great Depression and in the 1950s. We remained silent and permitted the incarceration of nearly 120,000 Japanese Americans during World War II. NewsletterClick here to sign up for the weekly THINK newsletter, bringing you the best opinions, sharpest analyses and most powerful essays of every week. Today, we have an opportunity to recognize the wrongs in front of us in the moment and to take a different course. I am moved by the outpouring of protests in response to policies like the transgender military ban, the rescinding of DACA and severe restrictions on who can seek asylum and refuge at our border. Whereas once some may have been too ready to believe that blatant discrimination against a minority was justified, or to know it is wrong but to acquiesce by remaining silent, we have come to realize that violating the core American value of equality causes lasting harm and undermines our country’s strength. Frederick Douglass once said, in exhorting his fellow African Americans to enlist in the Union Army during the Civil War, that whoever “fights the battles of America may claim America as his country — and have that claim respected.” Transgender soldiers are already serving in the U.S. military, fighting the battles of America; their service and sacrifice establishes clearly their claim on America. Enabling discrimination against them calls into question our own commitment to the values we claim that America represents. Professor Robert S. Chang is the founding executive director of the Fred T. Korematsu Center for Law and Equality at Seattle University School of Law.